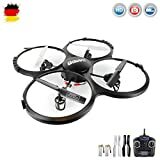 · ★ 2.4GHz & 6-AXIS GYRO: Adopts 2.4G wireless automatic frequency synchronization technology, which supports anti-interference performance and multi-model competition. The 6-axis gyro ensures precise positioning of the aircraft. · ★ HEADLESS MODE & 360° BREAKS: Once the fuselage direction cannot be recognized, you can enter headless mode to continue the flight. The 360° spin allows you to explore more exciting acrobatic actions. · ★ LOW VOLTAGE AND ONE BUTTON ALARM ON GROUND: When the drone has low battery, it emits an alarm sound to remind the pilot to stop the flight. The one-button return function directs the drone back to the pilot automatically. · ★ HIGH / MEDIUM / LOW SPEED MODE and LED LIGHTS: The three-speed mode meets the demand of pilots of different levels. You can track the drone with LED lights at night to avoid losing it.